CONTOUR's design is simple and compact: the spacecraft has a body-mounted solar array; few hinged and movable parts; and a mission geometry allowing use of fixed and passive antennas. Controllers point the scientific instruments and antennas simply by moving the spacecraft. A layered, heavy-fabric shield protects CONTOUR from speeding dust and particles during comet encounters. CONTOUR has two operating modes. The cruising spacecraft spins steadily on its main axis and "hibernates" unattended for months at a time, with most systems turned off. For comet encounters and Earth swingbys CONTOUR is 3-axis stabilized and fully powered, its attitude fixed and its dust shield and instruments facing their target. The Johns Hopkins University Applied Physics Laboratory designed and built the spacecraft, with instrument and component contributions from institutions and companies around the world. CONTOUR inherits much of its design and components from past or operating missions such as NEAR, TIMED, Cassini and Stardust, thus reducing costs and risks. Supplier: The Johns Hopkins University Applied Physics Laboratory, Laurel, Md. CRISP combines a narrow-angle optical imager with a near-infrared spectrometer. CRISP offers top pixel scales of about 4 meters - sharp enough to pick up surface details slightly larger than an automobile - and has 10 filters for visible color study of the nucleus. The spectrometer, covering wavelengths of 780 to 2,500 nanometers, has a spatial pixel scale about three times that of the imager. Instead of facing forward, CRISP points out from the side of the spacecraft, so it remains protected by the dust shield. The camera's tracking mirror keeps the nucleus in the field-of-view and guides the spectrometer slit across the surface, building up an infrared compositional map. It obtains its sharpest images just seconds before and after closest approach. CRISP is CONTOUR's "smartest" instrument. Scientists will load seven different imaging sequences in the camera's computer before each encounter; CRISP waits until the comet appears from behind the dust shield, then selects the appropriate sequence for the comet's location. CRISP's computer will also direct the spacecraft to "roll" if the comet isn't quite in its optimal field of view, and its mirror automatically tracks the nucleus for a full 30 degrees. Peeking through an opening in CONTOUR's dust shield, CFI locates and starts taking pictures of the target comet several days before the encounter. The navigation team uses these distant images to guide CONTOUR toward the nucleus, while the science team watches for phenomena in the coma. As CONTOUR speeds closer to its target, CFI snaps color photos of the nucleus - capturing the movement of gas and dust jets in the inner coma - and images the coma in wavelengths sensitive to major species of ionized gas. Instead of pointing directly at the comet and into the stream of speeding dust, CFI's telescope looks at a mirror mounted on the side of a cube. After the mirror is peppered and pocked by particles, the cube rotates and supplies a "fresh" mirror for the next encounter. 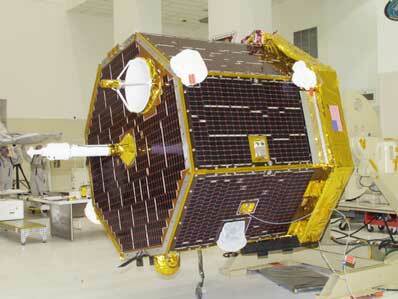 Supplier: NASA Goddard Space Flight Center, Greenbelt, Md. NGIMS measures the abundance of and isotope ratios for many neutral gas and ion species in each comet's coma. Combined with CIDA's dust measurements, NGIMS data will yield key information on the elemental makeup of the nucleus and allow scientists to study the chemical differences between the comets. Tracing its heritage to the Ion and Neutral Mass Spectrometer on the Saturn-bound Cassini spacecraft, NGIMS is a quadrupole mass spectrometer that employs two ion sources, each optimized for a specific set of measurements. Using both sources, NGIMS will rapidly switch between measurements of neutral gas and ambient ions in the coma as CONTOUR zips past the nucleus. NGIMS will measure the chemical and isotopic composition of neutral and ion species over a range of 1 to 294 atomic mass units. A copy of the Cometary and Interstellar Dust Analyzer instrument on the Stardust spacecraft, CIDA analyzes elemental and chemical composition of dust and ice grains in the comet's coma. The instrument consists of an inlet, target, ion extractor, time-of-flight mass spectrometer and ion detector. Dust particles hit the target (a silver plate) and generate ions, which are detected by a time-offlight mass spectrometer. (Since heavier ions need more time to move through the instrument than lighter ones, the flight times of the ions can be used to calculate their mass.) Detectable sizes range from 1 to several thousand atomic mass units, encompassing the elements and many compounds, including heavy organic molecules. Both CIDA and NGIMS will collect data continuously for several hours on either side of closest approach to the comet. Comet dust particles are like speeding bullets to a spacecraft going 60,000 miles an hour, but CONTOUR has its own bulletproof vest: a 25-centimeter (10-inch) thick, layered shield of Nextel, a dense fabric like that found in firefighters' coats (among other uses). Much like the shield protecting the International Space Station, its separated layers of Nextel shatter incoming dust grains, and a Kevlar backstop absorbs remaining debris. CONTOUR uses an APL-developed Integrated Electronics Module (IEM), a space- and weight-saving device that puts a spacecraft's core avionics onto small circuit cards in a single box. CONTOUR's IEM contains 10 cards that comprise the command system, data collection and formatting system, data recorder, guidance and control processor, and X-band receiver and transmitter. CONTOUR also carries a backup IEM. CONTOUR has a solid rocket motor and a blow-down hydrazine system. In its only use, the STAR-30 solid rocket motor provides the 1,922 meter-per-second change in velocity ("delta-v") CONTOUR needs to blast out of Earth's orbit and enter a heliocentric Earth-return trajectory on Aug. 15, 2002. The hydrazine system, used to maneuver the spacecraft for the remainder of the mission, includes 16 thrusters placed in four modules of four thrusters each. CONTOUR's transceiver-based Xband communications system includes an 18-inch directional high-gain dish antenna, two lowgain antennas and one pancakebeam antenna. The worldwide stations of NASA's Deep Space Network provide contact with the spacecraft after launch. CONTOUR uses its high-gain antenna to send data and receive commands when 3-axis stabilized; it uses a low-gain antenna when spinning in Earth orbit and between comet encounters and Earth flybys. In either mode, the spacecraft can receive commands and send data at the same time. CONTOUR's radiation-hardened, high-performance 32-bit Mongoose V processor receives "time tagged" commands from the ground about a week (or sooner) before a scheduled maneuver or operation. Commands are normally uploaded at rates of 500 bits per second (bps), though the system can support rates of 7.8 and 125 bps. For data, CONTOUR carries two solid-state recorders (one backup) capable of storing up to 5 gigabytes each. Data and telemetry can be downlinked at rates ranging from 11 bps to 85 kilobits per second, depending on CONTOUR's distance from Earth, whether the craft is spinning or 3-axis stabilized, and whether it's communicating through the high-gain or low-gain antennas. CONTOUR's guidance and control system includes an Earth-Sun sensor, an advanced stellar compass (star tracker) and a gyroscope. When CONTOUR is 3-axis stabilized, its Mongoose V flight computer processes location and position information from the sensors to carry out specific Sun-, Earth- or comet-pointing instructions from mission operators. Ephemeris data on the positions of Earth, the Sun and the target comets is uploaded regularly into CONTOUR's flight computer. CONTOUR has no internal reaction wheels. Operators fire the hydrazine thrusters to point, spin up, spin down or otherwise move the spacecraft. 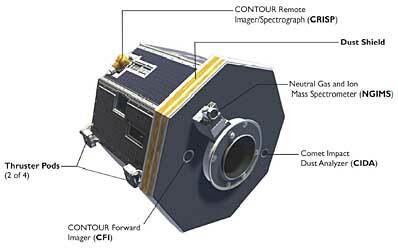 The processor in CONTOUR's primary digital camera (CRISP) also "talks" directly to the flight computer during comet encounters, directing the craft to roll (if necessary) to keep the nucleus centered in the camera's tracking mirror. 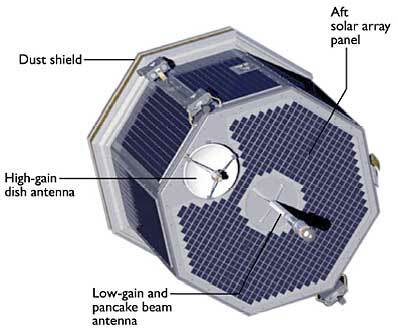 Deep space missions traditionally use transponders for both communication and navigation. A transponder is a "coherent" system in which the downlink frequency is based on the frequency of the uplink signal from Earth. With such a system, navigators can compare the received downlink frequency to the known transmitted uplink frequency and determine the velocity of the spacecraft (relative to Earth) from the Doppler effect. The non-coherent Doppler system on CONTOUR, however, uses a transceiver in which the uplink and downlink frequencies are independent. The spacecraft uses a simpler transmitter/receiver combination with an on-board oscillator. The frequency of the uplink signal received from Earth is compared to the downlink frequency at the spacecraft, and the results are put into the spacecraft's telemetry. Before performing orbit determination, navigators on Earth use this telemetered information to convert the downlinked Doppler record into what it would have been had it come from a coherent transponder. While this technique requires an additional processing step relative to coherent transponding, its performance is just as accurate. It also enables simpler, more flexible hardware to be incorporated into highly integrated electronics modules such as those flown on CONTOUR.